Truly great day ( for 30 of us). Got confirmation of my entry last night from Stan and finally sorted my route out. The first climb done in the car did scare me but at least it sorted out a few discrepancies when trying to plot a GPS route. Got to the Aqueduct car park in good time, so good that I was nearly first there. Peter was there from the Presidents CTC ride last year and A.N.Other. One thing that quickly became apparent was that this was a serious ride. You only had to look at the equipment being unloaded off or out of the cars to see that you don’t take on a ride like this lightly. Carbon was everywhere, a year or so it unusual but not anymore. I used to get asked if my Trek was carbon with various remarks about it. There was a chap with a nice new shiny Rourke in I think 953. The AAA points mark it out as a serious ride and looking by the low entry numbers I think it scares a lot of people off. Call it a Sportife, charge 3 or 4 times the entry fee, put a start finish banner up and there would be hundreds here. You can talk about gearing all day and by enlarge we did. You need some low gearing for an event like this, the lower the better and then your still likely to find it not low enough. I’m riding 30×27 which is quite a popular combination for a triple once you’ve found 25 a struggle on some of the steep stuff. Compacts usually come in 34×27 and there were plenty here using that gearing. It’s the trade off for not putting a triple on a bling carbon bike. It all comes into focus within 2 Km of the start. 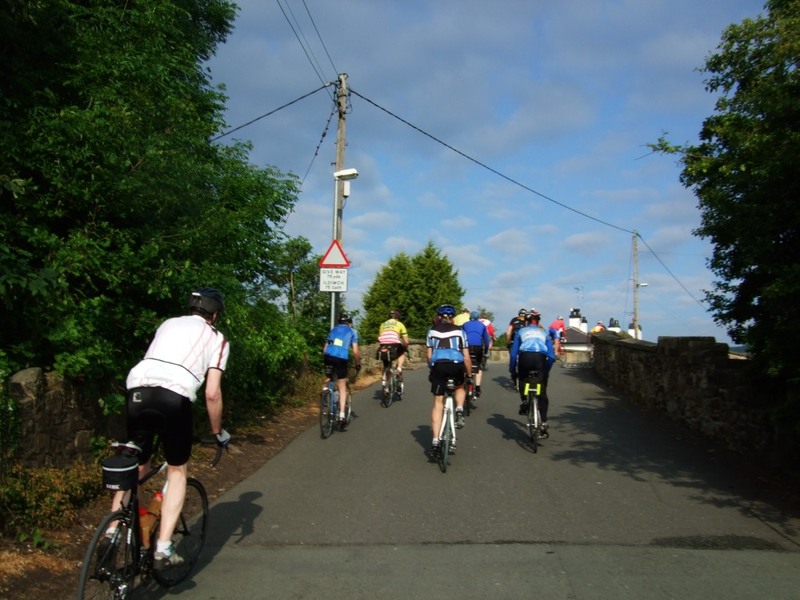 Once we had been set off it was a spectacular ride over the canal and a descent to the River Dee. Here we got to see the aqueduct in all it’s glory. No time for a picture yet as the is a small climb up past the finish and then on to the first dish of the day. Methodist Hill and a no swearing clause in the route. Marked down as 18% and the Garmin Edge 705 proved it true. This was seriously steep and had me maxxed out along with most of the field on their carbonfibre exotica. Don’t forget all those Compact chainsets. Now I’m struggling along with the rest of the Lycra clad brigade when this chap on an old nail of a bike just spins past us. Not only that he has a saddle bag across the back that could deliver mail to a small postal district. He just disappeared into the distance, I’m pretty sure it was Stan the organiser. I voiced the opinion that this guy was taking the piss only to have it confirmed further up the climb. He was gone and we were left floundering in his wake. 7 km in the first checkpoint, name on the silo which I got and the others of Phil and Peter missed. What goes up comes down and it was a steep descent onto the A road leading to the Chain Bridge Hotel. There is a bit of history here, 27 years ago I spent my honeymoon there and went back for my 25th Wedding anniversary. Spent a couple of days on Brian’s trail bike that I managed to set fire to after the wedding reception. Just Married, bike on fire, a great start. The place was on the up when I went back and I’ve got to admit the scrambled egg with salmon for breakfast is one of the finest things I have tasted. It was superb. Cooked to perfection, memorable for the rest of a lifetime. Caught up with Peter and Phil and then it was on to another highlight of the day, the Horseshoe Pass. Phil was off the front and I went up chatting to Peter. In the granny at a few steep bits but it’s not the worst thing on god’s earth. I think it’s reputation comes from it being an A road. Stop at the top for a photo shoot and then on past the Ponderosa. The next bit has me going downhill on the drops, I ease up for the cattle grid as I don’t want to puncture as Guy did on another ride. Next thing this chap on the Rourke is having a go at me, No Fear with this guy, he has taken lots of yards out of me by not slowing for the cattlegrid but stops for his mates at the roundabout up the hill. Further on I’m on the front but the dreaded Cateye rear light bracket comes into play. The road is that rough that the bracket slides down the seatstay and starts rubbing on the cassette. Phil and Peter stop twice but Rhyll CC are gone. The light gets put in the pocket. A wheel is always handy on a ride, you’ve just got to get on the right one. The first control is the cafe car park by the river in Ruthin and gives us a chance to regroup. The next section out of Ruthin is really nice with a gradual climb along a valley through Clocaenog Forest. What goes up must come down and there is a steep descent to Pentre-llyn-cymmer. Don’t ask how you pronounce it even the simple stuff is hard enough. The control at Llyn Brenig is a chance to grab a bite to eat and fill a bottle from Stan,s van and a chance to mingle again with other riders. Rhyl CC were really good to us on this ride, pointing out danger points and warning us of what was to come. Climbing out of Llyn Brenig the scenery changes to rolling moorland with no trees for miles. For some reason we have lost the Rhyll CC wheel, Peter falls back on the fast descents as he is on a flat bar bike. The descent to the next info point is big ring stuff with me getting up to 40 MPH. I was going great guns until a car overtook me and a startled sheep ran across the road. The car braked heavily, there was another car coming the other way to compound things with this sheep and it’s lamb darting all over the road. I’ve mentioned before about descending on the drops because of the better braking leverage and boy did it come into play here. Grabbing the brakes at 40mph had the rear lock up and step out on me in an adrenalin filled moment. The sheep and lamb darted back onto the moor and Peter and Phil drew up having watched the antics from behind. Regaining a bit of composure I wasn’t going to waste the rest of the descent so gave it another go to the next info point at 100 Km. ” Distance to Bala on the signpost” , well it didn’t have one. There was a note on it but I didn’t see it, but what did catch my eye was all these familiar bikes outside this Cafe in the middle of nowhere. This place wants making into a control point next year if it runs. Tea at 75p in the middle of nowhere isn’t going to break the bank. Next up was the run into Bala going from 1200 to 550ft in the car park. It’s virtually all downhill to Corwen and we nearly have a run in with a boyracer in his Subaru Imprezza. The road was really potholed forcing us to come out. Others had passed OK but this lad wants to gun it as close as possible. I was expecting we would see each other again as what else is there to do but drive around in circles when you are out in the sticks. Sure enough he trundles by when we are stopped as Peter is starting to suffer a bit. The ride back to Llangollen is a bit lumpy with a small climbs that went up to 17% gradient on the Edge. The road takes us past the Horseshoe Falls and we join the route out to the bottom of the Horseshoe Pass. Word from Stan is the second left past the motor museum is the easier way up to the Panorama. The first left looked really steep and would have been a struggle. We stop at the next left for a discussion about going up that one. Peter doesn’t feel up to it, Phil doesn’t see the point with 2,600 plus metres under our belt so the road it was, turned out most had opted for the same thing. I think maybe a few of the solo riders did the last climb as you know your own pace and ride with that in mind. The turn in to Trevor can’t come soon enough. I’ve got to get a picture of the aqueduct from the bottom and Peter has to get some food in him even though the finish is about 300 yards away. A drink awaited at the finish and bought some excellent Bara Brith from the village hall. Chatted with some of the other finishers and then we had to decide the way back to the carpark. Stan suggested walking over the aqueduct and it proved to be a sound suggestion. It was quite busy even though it had gone 6. Canal boats running bridge tours and the one that you can see with Phil who I think were on holiday. Their holiday just got a bit more interesting as their engine cut out right in the middle. Phil and I are hobbling across on Look cleats and they still hadn’t got it going when I parked up the Toy for the final shot. There is a canal boat full of people on a trip backed up behind them. Pack the bike into the car and head home until the next one. Stunning detail when you zoom in, even where Phil and I walked across the Aqueduct. There is a lot that hasn’t made it into the post but I have to stop somewhere and this it it. Another great day. Great report and photos so far Frank, keep it going! the IP address gave the other Anon away, thanks for clearing that up. Not that many pictures left to post as it started to be about making the finish. A couple of good pictures to come but you can’t list everything that happens on a 10 hour ride. Shame you don’t have the motionbased links up anymore, I used to love looking at the routes you were doing on these rides. I’m still working working on the post. GarminConnect is not the same. I’ve just been stung for £51 for the year for MotionBased so they better not close it just yet. I’ll try and get the name of the Cafe we stopped at as it deserves to go on your list. The cafe you found is the best…. I came across it a couple of years ago and when we went the river nearby was so full it appered to be flowing up hill! !